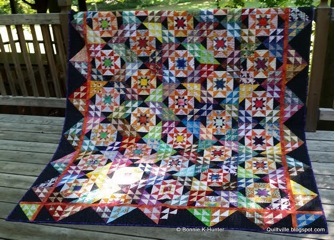 In this class for confident and adventurous intermediate quilters, students will learn how to work with the Essential Triangle Tool to easily make half-square triangles and flying geese from strips. They will finish the class with blocks for the Wanderlust quilt (pp. 60–67). Students will also learn to use color and value by playing with options—perhaps even swapping strips with other students in class. Two sessions would be best for this class. There are a lot of pieces in a 12˝ block, the ruler is used a couple of different ways, and students need time to play and practice. • Sewing machine in working order with ¼˝ foot, cords, etc. • Fabric for the project: 2 ½˝ and 1 ½˝ strips can be used with the ruler for the units in this book. The border requires 6 ½˝ strips of black background. TIP: Shops can easily kit and sell the strips needed for the blocks for this project. This quilt requires students to have ample cutting space. Table risers or bed risers to raise tables to cutting height are beneficial for accuracy when cutting. See pp. 60–67 for Wanderlust pattern and instructions. 1. Create the inner star using the stitch-and-flip method and demonstrate the same units using the Essential Triangle Tool for the flying geese. 2. Create the outer star points using the stitch-and-flip method and the Bonus Buddy included with the Essential Triangle Tool. Demonstrate the same units using the Essential Triangle Tool and strips. 3. Demonstrate half-square triangles for the block corner units using the Essential Triangle Tool and strips. 4. Demonstrate how the colored corners dictate the wing triangles on the outer flying geese by laying out the block and showing placement and assembly. 5. Construct blocks from units. 6. Demonstrate the half blocks. 7. Demonstrate using the Essential Triangle Tool to make half-square triangles from strips for the border units.